Preheat the oven to 350 F. In the bowl of a stand mixer, beat together the butter, lard or shortening and sugar until fluffy and creamy. Then beat in the whole egg, almond extract and vanilla extract. In a separate bowl, whisk together the flour, ground almonds and baking powder. On low speed, mix in the dry ingredients until just combined and you’ve achieved a stiff dough. Roll the dough into 1 inch balls and place them 2 inches apart on a silpat (silicone) mat lined baking sheet. 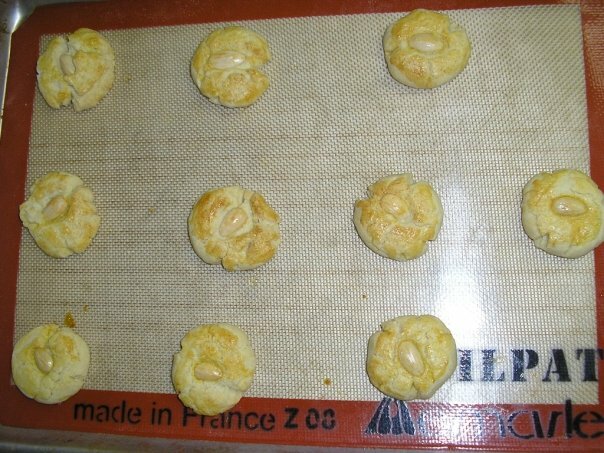 Brush the tops of the cookies with the egg wash. Then press an almond into the centre of each cookie, flattening the cookies slightly at the same time. The dough will crack slightly. Bake until the cookies are lightly golden, about 15 minutes. Allow them to cool on the baking sheet for 2 minutes before transferring them to a wire rack to cool completely before serving. Store at room temperature, loosely covered. These cookies also freeze well. I’m going to try this. Most recipes I’ve seen suggest using lard, which I cannot buy; or strictly butter, which doesn’t produce the same taste. Again, many thanks. I’ve found so many great recipes here! Hi Alison, I tried the recipe tonight and have some feedback. So far this is the best recipe not using lard, but I feel like something is missing. I also wanted to suggest toasting the almonds before grinding it into flour to give it a stronger almond flavor, plus brushing the cookie ball with egg first, then pressing the almond into it. If egg is brushed on after the almond is placed, the egg kind of makes the almond mushy and an unappetizing color. Thanks for the comment! It’s funny that you suggested brushing the cookie with egg before adding the whole almond, because I did it that way too, but by accident. I forgot to add the almonds until after I used the egg wash 🙂 Thanks to your comment, I will revise this Canadian Living recipe. Thanks again!